Good news! The UVOT/OM team of the MSSL Astrogroup has finished processing of two UV source catalogues based on the 10 years long series of observations from XMM and 5 years from Swift satellites! The Square Kilometer Array (SKA) is a next-generation radio interferometric telescope planned for construction in South Africa and Australia. 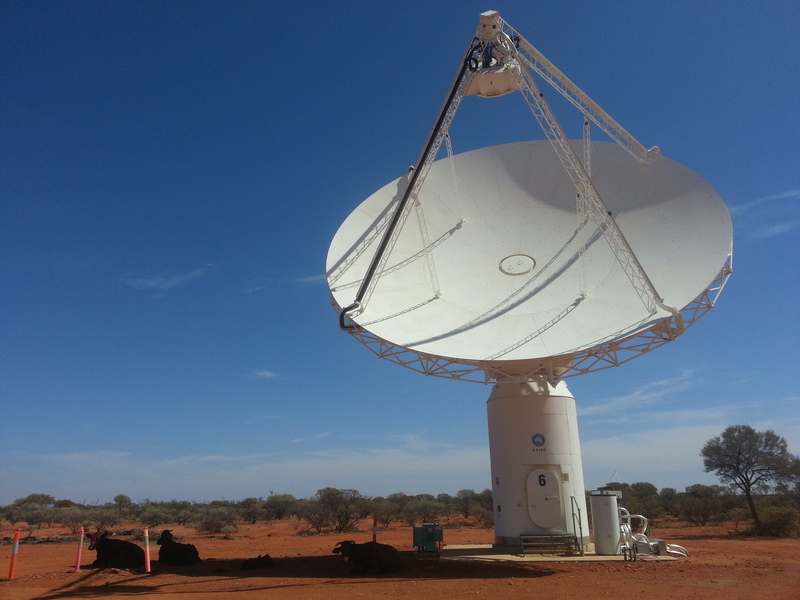 I’m attending the CALIM conference in Australia at present, which is focused on calibration and imaging for the SKA. A new era of radio astronomy is approaching rapidly. The design of the SKA is well underway, with construction scheduled to begin in South Africa and Australia in 2018. Moreover, many pathfinder telescopes intended to develop and test the core technology of the SKA are starting to come online now. The SKA will be comprised of thousands of separate telescopes, all acting together through a technique called aperture synthesis. 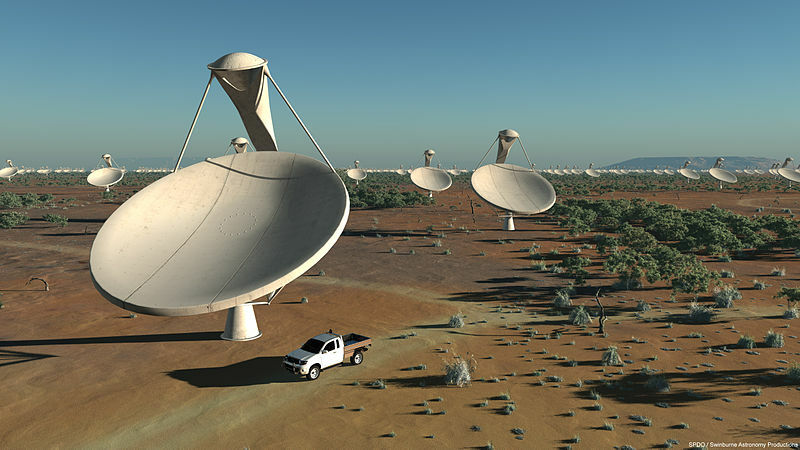 The resulting telescope array will synthesise one single massive telescope, with an effective size of one square kilometre, equivalent to approximately 200 football pitches. Radio interferometric telescopes like the SKA were invented in the UK by Ryle and Hewish, who won the Nobel Prize in 1974 for their achievements. These first radio telescopes consisted of just a handful of individual dishes. The thousands of individual telescopes making up the SKA will produce a tremendous big-data challenge, even taking into account the advances in computing expected over the coming years — the anticipated data-rate of the SKA is expected to be many times greater than current world-wide internet traffic! Furthermore, the SKA will see a very wide field-of-view, which complicates the modelling of the telescope significantly and dramatically increases the computational requirements further still. Calibration and imaging pipelines have been identified as critical bottlenecks of the data reduction pipeline of radio telescopes that need urgent attention. At CALIM, we are discussing recent progress in addressing calibration and imaging for the SKA. It seems to be generally agreed here at CALIM that we are moving to a new model for the analysis of astrophysical observations. Radio telescopes are typically designed, operated and their data analysed by large international collaborations of engineers and scientists. This will certainly be the case for the SKA. In the past, scientists interested in analysing the observations made by such telescopes would copy the observational data to their local institute, where they would perform a scientific study using the data. This model won’t be possible for the SKA since there will simply be too much raw data to transfer over the globe — the internet would grind to a halt! The new model for scientific studies is that, instead of shipping the data to the analysis, the analysis methods will be shipped to the data. Scientists will design and implement their studies and ship their analysis (essentially computer code written to perform the analysis) to the telescope site where the analysis will be run. Telescopes like the SKA will therefore not only need supercomputers to synthesise images from raw observational data, but also to run scientific studies. Interestingly, this seems to be a general trend, and other forthcoming telescopes, such as LSST, will also operate on a similar data analysis model. So far here at CALIM there have been many interesting developments and discussions regarding how to calibrate and image the raw data observed by the SKA. Some highlights include: status updates from LOFAR and ASKAP, which are SKA pathfinder telescopes that are coming online now; high-performance computing solutions, including highly parallelised approaches that use graphics processing units (GPUs); noise, power and computation requirements for the SKA, which are particularly daunting(! ); new approaches to deal with wide fields, like w-stacking and exploiting the fast multipole-method (FMM); theoretical understanding of calibration artefacts; and, finally, new compressive sensing techniques like those that I spoke about. If you’re interested in more detail about the latter, you can find my slides on my webpage. The challenges are large but there are many exciting new ideas, progress is being made, and prospects are good. And it wasn’t just the scientists and engineers here at CALIM that were excited about the SKA and pathfinder telescopes coming online. Apparently, the local wild-life also appreciate the new telescope dishes since they are one of the few places to find shade in the deserts where they are located. On an average day you can find hundreds of kangaroos sheltering from the sun by following the shade cast by the dishes. Unfortunately the kangaroos were somewhat camera shy, but some cows were caught in the act, as shown in the photo below.